Former Islamist president sent to 25 years in prison for espionage. An Egyptian court on Saturday handed down its final ruling in the trial of 11 people, including former Islamist president Mohammed Morsi and Al Jazeera journalists accused of leaking state secrets to Qatar. The court confirmed a ruling from May 7, when six of the defendants were sentenced to death, Al Jazeera reported. After that initial verdict, the Cairo court had to seek the advice of Egypt's Grand Mufti Shawqi Allam, the highest religious leader in the country, to be able to finalize the verdicts. Egyptian law requires the mufti to sign off on death sentences. His opinion is not binding but usually respected by courts, noted Al Jazeera. 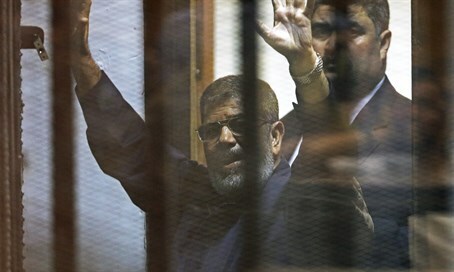 Morsi, the case's top defendant, and two of his aides were sentenced to 25 years in prison for espionage. The former president, a member of the Muslim Brotherhood, is already facing the death penalty on other charges. His lawyers also appealed a 20-year sentence handed down last year over the arrest and torture of protesters during his mandate. According to Saturday’s ruling, Morsi and his secretary, Amin el-Sirafy, each received an additional 15-year sentence for a lesser crime. El-Sirafy's daughter, Karima, was also sentenced to 15 years in prison. Those sentenced to death include Ibrahim Helal, former director of news at Al Jazeera’s Arabic channel. He is not in Egypt and was tried in absentia. Helal was accused of passing state secrets to Qatar in what human rights groups have dismissed as a politicized case and a sham trial. Egypt has accused Al-Jazeera in general, and specifically its Egypt affiliate, Al-Jazeera Mubasher Misr, of doing Doha's bidding by serving as Islamists' mouthpiece at a time of a ferocious crackdown on their ranks. As a result the country has jailed several journalists from the network over their coverage of the violent crackdown on Islamist protests following the overthrow of Morsi. The station denies any bias, saying it is simply covering Islamist protests, but in late 2014 it shut down its Egypt channel as Qatar and Egypt attempt to rebuild their ties. The others sentenced to death - political activist Ahmed Afifi, flight attendant Mohamed Kilani, and academic Ahmed Ismail - are in state custody, noted Al Jazeera. The verdicts can be appealed in Egypt's Court of Cassation.